View example content workflows for content governance such as maintaining website content or help centre documentation. In GatherContent, workflow makes the status of your content crystal clear. Workflow is the set of statuses that can be applied to items in your project to communicate their progress. The default workflow will depend upon the project type that was selected when the project was created. Accuracy check - Set deadlines with this stage to send reminders when content needs to be reviewed for accuracy. If there are no edits required, shift it back to 'Approved' or 'Live' or into 'To be updated' if edits need to be made. You can customise your workflow as much or as little suits for your project. 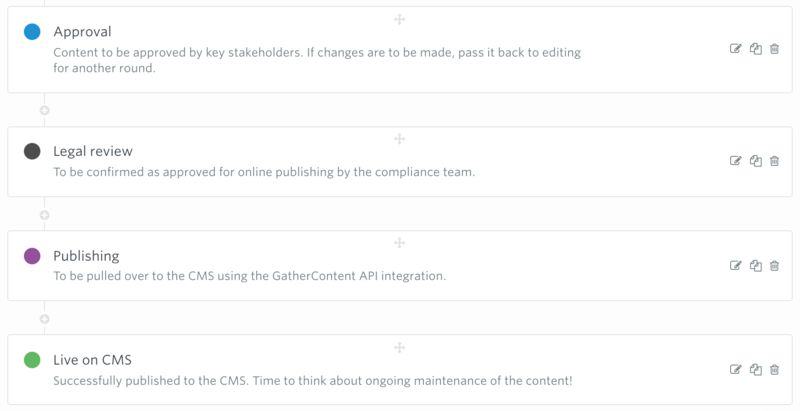 We recommend that before content production begins you should agree your content workflow with your team and then setup your GatherContent project workflow to reflect this. This helps keep everybody clear on responsibilities and the review process.